The journey has come to an end. There is only one mission left: to defeat Manjappa. Warden, the Promethean AI, has sent the Firewall team to Mars to track down and confront Manjappa, the author of Know Evil. Manjappa isn’t willing to go down without a fight though. Can they survive the final battle and even so, what will happen to them after the mission is completed? Everyone must face up to the decisions they’ve made over the course of their investigation. Find out what happens to Bartleby, Preston, SAIROC, Gerard, Quoth, and Fei Yin! Our next campaign is an Iron Heroes campaign called the Fortunes of War. It follows the saga of a group of soldiers turned merchants as they try to fulfill their destinies during a war along the Silk Road . After that, we have a Night’s Black Agents campaign called the Tribes of Tokyo – a group of security experts uncovers a horrific vampire conspiracy in the seedy underbelly of the city. Stay tuned! 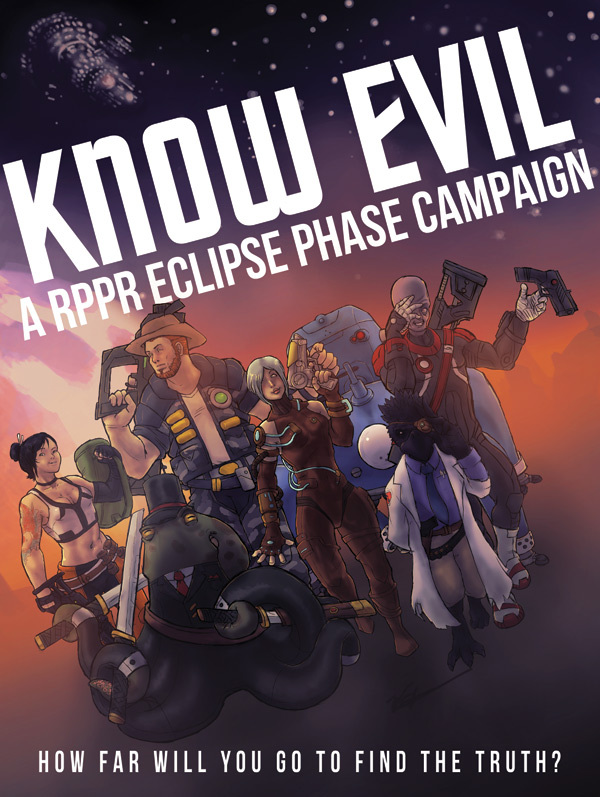 Download a high resolution image of the Know Evil Poster.